California Natural is produced by Natura, a company founded in 1992. California Natural promises wholesome ingredients such as lean meats and Vitamin E, and leaves out the additives, fillers and chemical preservatives. California Natural foods also contain no corn, soy, wheat or artificial coloring. California Natural is manufactured by Natura. Natura Pet Products is a subsidiary of Proctor & Gamble, Inc. Brand line includes: California Natural Chicken Meal & Rice Formula Puppy Food, California Natural Chicken & Brown Rice Adult Dog Canned Formula, California Natural Lamb Meal & Rice Formula Large Bites Adult Dog Food, California Natural Chicken & Brown Rice Formula Cat & Kitten Food, California Natural Herring & Sweet Potato Formula Adult Cat Food, and assorted treats for both dogs and cats. Company: Natura Pet Products, Inc.
Has California Natural Ever Been Recalled? Yes. In 2013, California Natural had a series of recalls because of potential salmonella contamination. In March of that year, several varieties were voluntarily recalled, and this recall was expanded in April. Finally, in June, there was another voluntary recall of all products in the California Natural line. Cause: Potential for salmonella. Announcement: FDA report dated June 18, 2013. What Was Recalled: The company first issued a pet food recall in March 2013, then dramatically expanded the recall the next month to include all dry dog and dry cat food and treat varieties of its most popular brands. Two months later, it was expanded again. 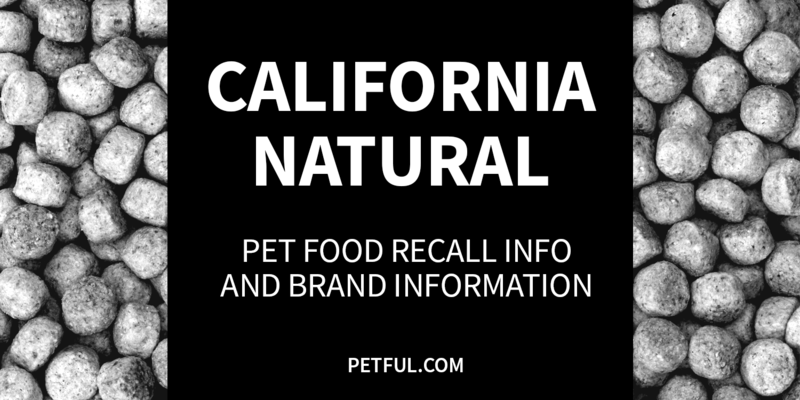 The recall eventually included expiration dates of June 10, 2014 or earlier of all California Natural dry dog and cat foods and biscuits/bars/treats. Have You Had a Problem With California Natural?